The Flying Dutchmen are represented on the 25th annual team by senior running back Shawn Jackson of Comstock Park (Comstock Park HS), senior defensive back Santino DiCesare of Dorr (Wayland HS), senior quarterback Michael Atwell of Geneseo, Ill. (Geneseo HS), senior linebacker Tim Klaus of Saugatuck (Saugatuck HS), receiver Taylor Brynaert of Washington, Mich. (Romeo HS), sophomore punter Dean DeVries of Grand Rapids (Grandville HS) and senior placekicker Evan Finch of Ann Arbor (Pioneer HS). Atwell, DiCesare, Jackson and Klaus have been listed as pre-season All-Americans while Brynaert, DeVries and Finch have received honorable mention recognition. Jackson and DiCesare both made the third teams for offense and defense, respectively. Jackson rushed for 845 yards and four touchdowns last season. Jackson currently is eighth all-time with 2,129 yards. DiCesare was second on Hope last season at 8.5 tackles per game. He also intercepted five passes. Atwell and Klaus are fourth-team selections. Atwell threw for a MIAA-high 2,254 yards and 18 touchdowns in 10 overall games last season. Atwell ranks seventh in school history with 3,923 career passing yards. Brynaert, DeVries and Finch all are honorable-mention picks. Brynaert topped Hope last season with 642 receiving yards and 47 receptions. He finished second with six touchdown receptions. DeVries averaged 40.5 yards over 46 attempts last season, including a long of 58. Finch converted 33-of-35 PATs and all four of his field-goal attempts in 2012. The Flying Dutchmen report to campus on August 12 for the kickoff of fall practice. Their season opener is September 7 at North Park (Ill.). Their home opener is September 14 against Millikin (Ill.) University at Ray and Sue Smith Stadium. The nonleague game is part of Community Day, a celebration of the close relationship between the college and the city of Holland. Click here for a complete list of Preseason All-Americans. All first and second team USA College honorees are on the Watch List for the 11 Division III Position Player of the Year Awards. 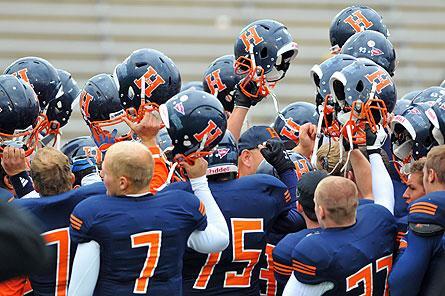 Recipients will be recognized at the annual USA Small College Football Banquet on the eve of the 20th Anniversary of the Hansen Bowl in February 2014. Every senior with no remaining eligibility, first, second, third, fourth teams and honorable mention as well as upcoming Regional Players of the Week are eligible to participate in the annual four-day, three-night event. All seniors participating in the event will be presented certificates at the Annual Small College Football Awards Banquet.